How many summer internships give you the chance to work on a security solution that’s changing the world? I was fortunate enough to be selected for a summer internship at Agari in Foster City, California, where top data scientists, software engineers, IT analysts and others take a data-driven approach to advanced email fraud prevention. During my time working on the Enterprise Protect team, I’ve had many opportunities to ship production code that touched several aspects of the product—each of which allowed me to grow my skills in different ways. One of the first challenges I got to work on was scalability, specifically with regards to ensuring that SAML or OAuth based services like G Suite SSO, Azure AD and Office 356 were not negatively impacted by infrastructure changes to configurations for certain organizations using EP. It was a great opportunity to familiarize myself with the codebase while learning about the importance of test-driven development and configuration consistency between staging and production environments. I received more exposure to frontend testing and separation of user privileges by working on adapting EP’s UI/UX to specific user roles and abilities. Of course, a big part of this involved learning about Ember. I dove deep into learning about its component lifecycle and other features like models, templates and routing. I learned a lot about Ember testing, too—specifically unit testing with QUnit and mocking test data with Ember CLI Mirage. This was also where I had my first glimpse at the role of serializers in passing data between the back-end and front-end portions of EP. I had the opportunity to learn even more by diving into the backend of the product. Among other things, I converted PostgreSQL queries to Elasticsearch aggregations and saw firsthand how this simplified the codebase and improved performance by removing the need for models and aggregated data stores. I also gained experience with test-driven development for Ruby using RSpec, and learned more about the data pipeline that Agari uses to provide insights to organizations about threats relating to their email security. Finally, I was able to combine what I learned from these various experiences during a final project integrating the automated setup of infrastructure resources on Amazon Web Services (AWS) into EP’s UI. This turned out to be an excellent capstone to my summer internship because it incorporated many different elements of the test-driven development and full stack technologies I was exposed to along the way. If you’re studying software engineering, you totally get how big of an opportunity this was. Here’s the thing. Not only was I given a lot of responsibility during my time at Agari, but I also received a lot of valuable guidance and mentorship—and I’m incredibly grateful. In short, I found a place to learn, grow and contribute to something big. This I’ve found is more the norm than the exception at Agari, and it comes from the top down as the founder and CEO discuss in this article published a while back. For me, a couple of valuable lessons learned. On a practical level, my summer internship taught me that test coverage is often as important as building the actual feature. And that writing maintainable code is more important than writing a lot of it. But most important of all, I gained a view of my work as part of the bigger picture, solving a real need for every business to be able to count on trusted, secure email communications between employees, partners and customers. This wouldn’t have happened without amazing team players and a corporate culture that embraces innovation and employee empowerment. There’s a reason why Agari has great Glassdoor reviews and was voted on of the best places to work. It’s a diverse workplace where work-life balance is fueled by employee empowerment and respect. It’s a place you might want to check out if you want to contribute to something big. 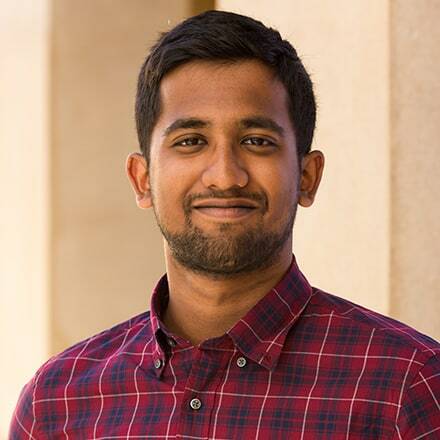 Srinivas Malladi interned as a software engineer at Agari during Summer 2018 on the Agari Advanced Threat Protection team. He is currently majoring in Computer Science at Stanford.